Drug abuse and misuse can affect any family. When you think about medicine cabinet safety you may think that a younger child's access is the main concern. It can be easy to assume that adolescents aren't going to rummage in the cabinet and then curiously swallow a brightly coloured pill. 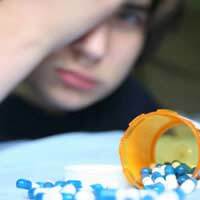 The potential for adolescent prescription drug abuse, however, is a very real and concerning one. The difference lies in motivation- younger kids are more likely to meddle with the medicine cabinet out of general curiosity while teens are using over-the-counter and prescription drugs to get high. Of additional danger is the potential for teens to use medications in your cabinet as a means to suicide. The teen years are well known for being a time of many changes, both physical and emotional, along with social issues such as peer pressure. Parents may worry about their teens using illegal drugs. Even the media and schools place an emphasis on education in this area while often ignoring the potential that lies directly in the family home. The current reality is perhaps surprising in that recent studies have suggested teens today are more likely to use a prescription painkiller to get high than to have used illegal drugs such as cocaine or ecstasy. A major fear is that there is now a new generation of teens that will get used to experimentation and become hooked on legal drugs, which can actually be considerably more difficult to regulate. Why Do Teens Abuse Legal Drugs? Easy access: Teens can usually just open up a cabinet and take the desired drugs. Perception of low risk: Because the drugs are legal, teens often think that these are ideal because there won't be any legal ramifications. Perception of safety: Teens think that experimentation a legal drug will be much safer than an illegal drug, which is not the case as both can lead to drug abuse. Both legal and illegal drugs can be extremely dangerous. What Drugs Do They Abuse? Virtually any medication in your medicine cabinet has the potential for drug abuse. Common ones include stimulant drugs used to treat attention deficit hyperactivity disorder (ADHD), pain-relievers, mood drugs for anxiety and prescription strength sleep aids. Teens may also mix these drugs with alcohol for an amplified effect, which can lead to overdose. Sadly, the adolescent years can be challenging and unhappy ones for many people, leading to depression which, when left untreated, can lead to suicide. Overdoses from both over-the-counter and prescription medications are a leading cause of suicide attempts in adolescents. This is partly because medicine cabinet contents are easier to access than other suicide methods such as guns, for example. There are two key aspects to protecting adolescents from drug abuse. The primary one is that of access. A medicine cabinet should remain locked to stop any access to its contents without your permission. If your teen needs a remedy in the medicine cabinet, you can choose an appropriate one and should lock the cabinet door afterwards. Also important is the psychological aspect. Why teens experiment with drugs is a complicated subject but if you can keep communication open with your teen, he or she may be more forthcoming with sharing any troubles. It's also important to address the psychological aspect because there is the potential that if your teen can't access your medicine cabinet, then access will be gained elsewhere. As such, a multi-faceted approach is needed to prevent your teen's desire to access your medicine cabinet and also ensure that the access is not open if your teen is considering abusing medications. Your medicine cabinet exists to provide remedies and treatments for common ailments as well as safe storage for prescription medications. It can be frightening to imagine your teen son or daughter accessing its contents for a recreational high and you should keep it locked at all times. By embracing open communication, a non-judgmental attitude and talking to your teens about drugs, your medicine cabinet can remain a support for health rather than a potential opportunity for drug abuse.